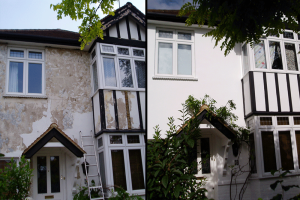 We offer our commercial & residential/domestic customers an efficient, safe & cost effective exterior painting service in London & all surrounding areas. For your residential/domestic & commercial, school, shop, businesses, offices, industrial unit, hotel, hospital, apartment and much more. Health & safety is an important part of any business and we ensure that all our Health and Safety procedures are in place. We are dedicated to provide a professional, safe, environmentally friendly, high quality and cost effective service to every customer. We don’t send out contractors – you will always see a Fully Uniformed member of the Thames Gutter London team with over 20 years experience. 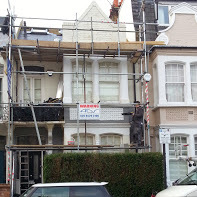 Is Painting fascia boards, soffits & apexes also Painting & repairing sash wooden windows. Painting railings and garden fences. Painting and decorating exterior walls. Applying render where needed to the outside houses/property. 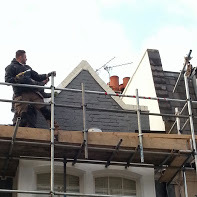 Thames Gutter London use ladders, Scaffold or cherry pickers for All Services/work carried out by us. Yes we have a very large database of residential and commercial customers that are happy to supply you with written testimonials. If you would like further information on our exterior painting services on residential or commercial property’s, please do not hesitate to contact a member of our helpful team. Our guarantee is simple, unlike many other services it’s difficult for customers having their Exterior painting services to inspect the finished results, so we will provide photographic evidence to reassure you in our ability to offer complete satisfaction and to alleviate any doubt we give every customer whether it be residential or commercial & a FREE 5 years guarantee. * In the event that you have any problems within 5 years following a exterior painting services by us, we will call back and fix it free of charge.